StarSurfCamps - Amazing Surfing Holidays in Australia! With Australia on pretty much everyone’s bucket list when it comes to dream holiday destinations, we’ve got another fantastic reason for you to hop on a plane and finally check that box: Our epic partner surf camp right in the heart of Down Under’s surfing epicenter for beginners! Only two hours south of Sydney, our surf camp is located on Australia’s best beginner surf spot and offers you beach-front accommodation, amazing surf camp vibes, great food and company, surf lesson from experienced instructors and the latest surf equipment – everything you need to make your Australian surf camp adventure an unforgettable experience! Only two hours south of Sydney, our amazing partner surf camp is located on Australia’s East coast at Seven Mile Beach Gerroa, Australia’s no 1 surf spot for beginner surfers! Escape Europe’s cold and rainy winter months to experience one of the most amazing countries in the world when on surf holidays with us! Expect vast landscapes and untouched wilderness, get excited about hot beach days and epic surf sessions, look forward to meeting new people from all over the world and simply get yourself ready for an unforgettable surf camp adventure living the real surfing lifestyle in Down Under! Our motto here’s pretty straight forward: Eat, Surf, Sleep, Repeat! We start all our surf camp weeks on Monday mornings from the awesome Wake Up! hostel in Sydney, only a short walk from the central station. From here, we hit the road along Australia’s beautiful East coast to our surf camp at Seven Mile Beach Gerroa, where you’ll learn to surf on the country’s best beginner surf spot from some of the continent’s best surf instructors. After 5 surf camp days, loads of surfing and heaps of fun, our Surf Fever guests are dropped off back in Sydney on Friday evening. 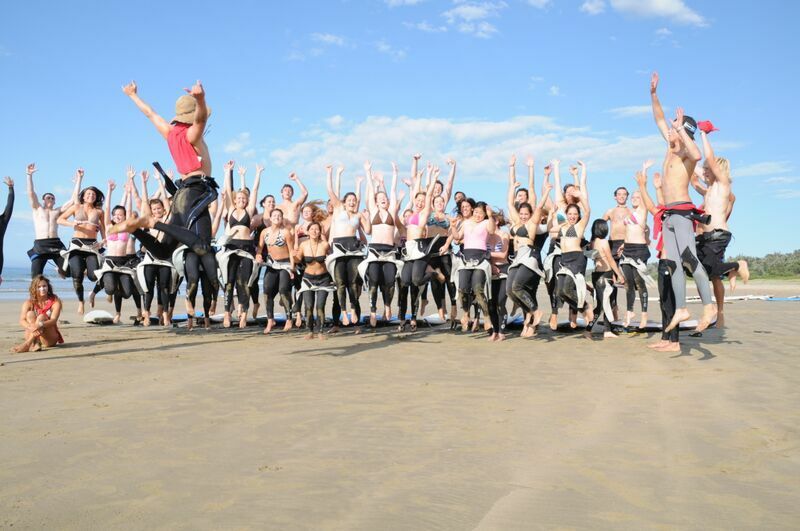 If you’re joining us for the Surf Sensation, then get excited about what’s to come! On Friday night we hit the road on an overnight express to Australia’s surfing epicenter, the world-famous Byron Bay! Together with our local guides and unlimited use of all our surf equipment, you’ll spend your next two days ripping! For all our extreme Surf Extravaganza surfers, the adventure starts now: We board our overnight express and are headed for Yamba, another great East coast surf spot, for 3 days of surfing and 3 nights of partying. In Australia’s surfing mecca, Byron Bay, we’ll finish our surf trip on a high with more surf sessions and party vibes! Live the REAL Surfing Life! Just a stone’s through from Seven Mile Beach, our surf camp on Australia’s East coast consists of comfortable cabins that sleep up to 7 people. Equipped with linen and a balcony, the lodges all surround our social, shaded eating and entertainment area. Here, we serve food, play music and show surf movies on our large screen TV. We’ve also got cosy hammocks nestling between palm trees, a swimming pool and bouncing pillow for you to hang out in after a long day surfing. A Café, bathroom, shower and laundry facilities can also be found onsite. And yes, there’s Wi-Fi! You’d like a little more privacy when surfing with us? No worries. Upgrades to private or double rooms are available upon request. 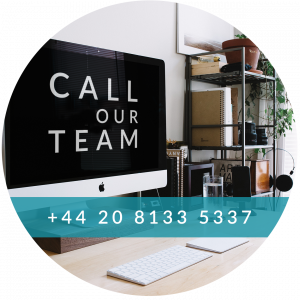 Simply talk to one of our surf travel experts! In our fantastic surfer’s hostel, your 3 days and 3 nights in Yamba will simply fly by! Just metres from the beach, your hostel here is owned and run by surfers, offers you cool and comfortable, surfer-style dorm accommodation, a rooftop swimming pool, pool table, cozy Surf Café and more! 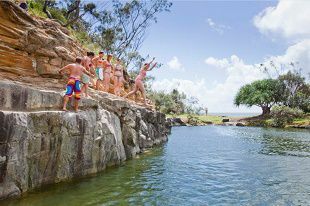 You’re Right in the Heart of Byron Bay! 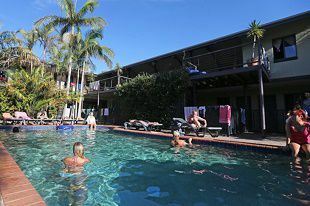 In Byron Bay, you’re as centrally located as can be in our super stylish backpackers. Only minutes from Byron’s perfect waves, you’re also right in the heart of town with all its busy bars and buzzing nightlife on your doorstep. A swimming pool and games room are just two of many facilities you can use free of charge! 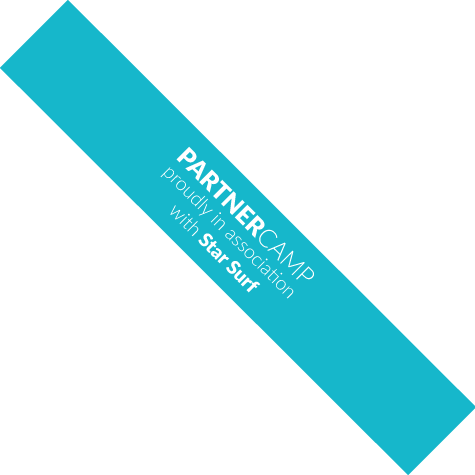 Star Surf – Delivering Surf Lessons with Excellence! Our No. 1 priority here at Star Surf is to deliver the best surf lessons! In order to do so, expert knowledge of the local beaches and waves is necessary. 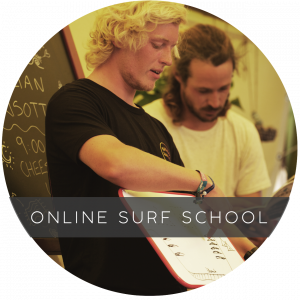 In order for us to provide surf holidays all over the world and still guarantee those first class surf lessons, we have very carefully chosen partner surf camps that share our passion for surfing and teaching. Every year, 3000+ surf holiday guests learn to surf with our enthusiastic and professional approach. All our surf instructors are experienced, fully licensed and qualified and also have a lifeguard qualification to provide a safe environment in and outside the water. On Australia’s East coast, we’ll teach you everything from paddling, standing up and turning, to water safety and surf theory, how to read waves and currents to surfer slang and etiquette. For every surf session, our surf instructors are with you in the water, actively helping you to catch waves. And to progress even further, you’ll be taught by the same instructor every day, so he/ she can help you identify strengths and weaknesses quicker. On top of that, we’ve got our surf-videographer at hand to capture your waves! Surf Spots – Where we Surf! Fortunately enough, our ‘local’ is considered Australia’s best beach for learning how to surf. 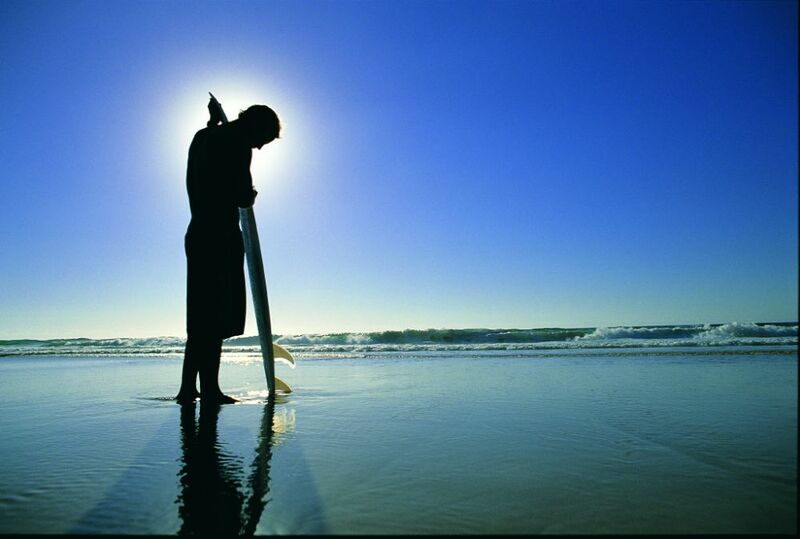 Here, only two hours south of Sydney, we have ideal conditions almost every day to teach you the essentials of surfing. A little further north is Yamba. The perfect beach breaks here attract all surf levels and offer you the ideal surf spot to show of your new skills. As if it were designed for surf schools in the creation of mother earth, Yamba is a destination that offers consistency and a fast track training ground for surf newbies and intermediate surfers. With the wind shelter from almost all angles and easy, mellow, rolling waves ideal for catching some of the longest waves of your life, this spot is a perfect stop-off for those really wishing to improve their surfing in a short space of time in a comfortable and hospitable environment. Party waves galore! Byron Bay is world famous for being one of the coolest places in the universe! Undoubtedly, this is a cause of the young, exuberant surf culture that resides here. The waves here are as diverse and varied as the local wildlife. Some of the best barrels and long peeling waves are on offer at the pass where you are likely to spot dolphins and whales in the line-up. 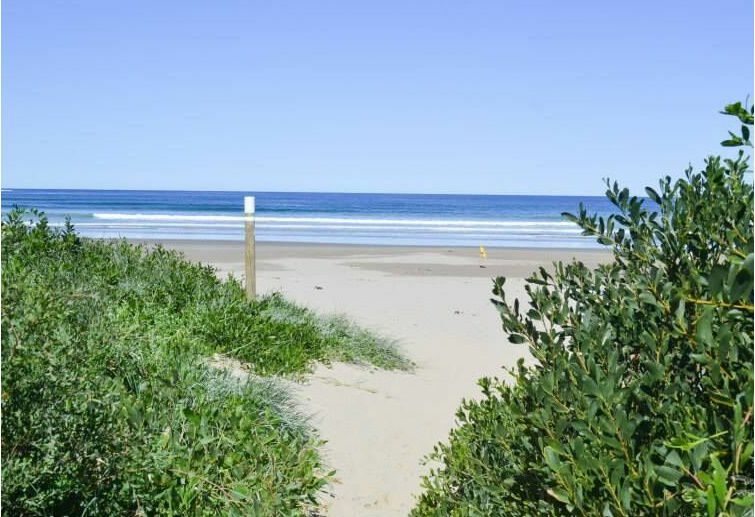 Tallow beach offers some world-class beach breaks with A-frames and short peaky rides. And for more of a cruisey surf Wategos has consistent, mellow waves. With your surf-guides on hand for your last days here, you’re sure to find the best waves suited to your surfing ability. What do you crave most after a long day surfing Australia’s awesome waves? Food, for sure! Heaps of it! That’s why in our surf camp in Australia all meals are included in all our surf packages. So, dig into our delicious breakfast buffets with Cereal, fresh baguettes, toast, rolls, biscuits, fresh fruit, juices, tea, coffee, Vegemite(!) and more! Our buffet-style dinners include burgers, pasta dishes, stir frys, soups and salads and, of course, real Aussie BBQs. We also cater for vegetarians, vegans and other dietary requirements. Just let us know when booking your Australian surf camp holiday adventure! For all our Surf Sensation and Surf Extravaganza surf holiday guests, you’ll also be provided with three breakfasts and three dinners in Yamba and one breakfast and one dinner in Byron Bay. What to pack for your surf camp holiday adventure in Australia! We provide you with all surf equipment, plates and cutlery for meals as well as linens. I have never surfed before. Can I still come? A BIG YES! Our surf camp in Australia is located on Down Under’s best beginner surf spot and our surf lessons are specifically designed for beginners. Our surf instructor team is with you in the water to teach you how to paddle, to stand up and turn, elp you read waves and currents, everything you need to know about surf theory, water safety and, of course, Australian surfer slang and surf etiquette. Can my friends and I stay in the same cabin while in the surf camp in Australia? Yes, you can. We only allocate cabins once all of you arrived in the surf camp. We can then arrange for you and your friends to share a cabin for your time in the surf camp. Do you provide transport to the surf camp in Australia? Yes, we do and it’s included in all our packages! All our surf camps start on Monday mornings when we meet at Wake Up! Hostel in Sydney, only a short walk from the central station. From here we start into our surf holiday adventure in Australia! Can I bring my own surf equipment? Yes, you may bring your own surf gear. Transporting surfboards from Sydney to the surf camp is not a problem. Simply let one of our surf travel experts know in advance, so we can make arrangements. Why do I need travel insurance for surfing? You are covered under our insurance when surfing with us during our surf lessons. For all your time free surfing, you need your own surf travel insurance should you, for example, damage somebody else’s surf equipment.